Restoring a wall starts with removing the old plaster and all the odd pieces and covers which are not original, such as pieces of cement, gypsum, wood, plastic etc. The best way to remove the old mortar from the surface is doing it manually bit by bit with a pick hammer. To remove harder (cement) mortar you need an electronic percussion hammer, but this is very heavy to use and you have to do the finish with your pick hammer afterwards anyway. If you want to leave the stones visible afterwards, you have to remove the old mortar to a depth of about 2 cm between the stones. Don’t worry about stones moving or falling out, but put a tarp under your working place to catch them, especially when working at height. Afterwards, you have to wash the wall with water (either with an ordinary water hose or with a Karcher) to remove all the loose, dusty pieces. You wash from top to down and don’t pose the nozzle directly into the joints to avoid washing out the sand from the inner parts of the wall. In case you need to replace stones, take the same natural stones which are used in your wall. You place them in a lime mortar bed. Mix 3 parts of fine sand (0/3) with one part of lime hydraulique (NHL 3,5) and water. It’s difficult to say how much water you have to add as this depends on how much water is in the sand, but you should be able to form it by hand. If it’s too dry, it will fall apart, and if it is too muddy, it will drop out. However, you can replace the stones immediately after washing the wall. If you want to plaster walls made of natural stones you SHOULD use a lime mortar. It supports the exchange of humidity and lets the wall breathe. It is comparatively flexible and moves with the wall and does not crack. A cement mortar mix is very strong and does not support the breathing of the wall. Sooner or later, you will get the problems with dammed up humidity and cracks on the surface or the stones. Adding impermeable supplements to a lime mortar mix is also reducing the ability of the wall to breathe. 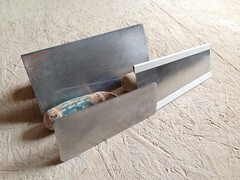 The best temperature for plastering is between 12°C – 20°C. It shouldn’t be too cold or too warm, thus you can’t really plaster in summer. The mix would be drying too fast and crack. Even though the composition of the three layers is different, the application is always done by hand. We are using hydraulic lime for the first two layers and air hardening lime (chaux aerienne) for the finish. Lime gets its mechanical firmness through an exothermic reaction by adding water. Hydraulic lime contains also minerals and is therefore drying much faster, can be applied thicker but is not so shock resistant. Chaux aerienne is pure lime and you can add as much water as you like (e.g. for lime wash paint) to work with. It dries in air for several weeks or months and gets it shock resistance while drying. It can be applied only in very thin layers. This is a semi-liquid mix of 2 parts of sand (0/3 – 0/5), 1 part of hydraulic lime (NHL 3,5) and water. It is necessary to have a good grip for the following couches. The maximum thickness is 7 mm. Experts are throwing the mixture by using a normal sized trowel with their backhand on the wall. For the amateur this is very difficult. Make sure, that your wall is damp. However, afterwards you have a rough surface with a good grip for the following layer. If you want to only close the joints and leave the stones visible, then you can skip this stage. The second layer is the most important layer of your enduit. It gives your wall the final shape and protects it by its thickness. You apply it 48 hours after the gobetis, but make sure your wall is damp enough. Mix 3 parts of sand (0/3) with 1 part of hydraulic lime (NHL 3,5) and water. This mixture should have a thick but creamy consistence and will be applied with a trowel. If it’s too wet, it will crack. You smoothen it either with your trowel or a taloche. The layer is 2-3 cm thick. For closing the joints and letting the stones be visible afterwards, you apply the mortar mix with a small trowel and press it into the joints. Let it dry a bit and sleek the joints afterwards with your small trowel or with a medium damp sponge. You apply the final layer about seven days later. You mix 3 parts of sieved fine sand (0,8) with 1 part of air hardening lime and water. Color it with mineral pigments but respect the color palette of your environment. Damp your wall before you start. Apply a thin layer of max. 1 cm and smooth it with a taloche. Colour the mixture with pigments if you like. Soak the pigments in water before adding it to your enduit. Try it with small amounts of ingredients to get a feeling for the handling and to find your right colour. Lime, plaster and marble powder and your wall underground are changing the intensity of the pigments. I always prepare several samples on the same underground material. Apply your enduit with a maximum thickness of 1-2 mm and smoothen it with a taloche. This procedure you can repeat several times with different colours but always in very thin layers. At the end you need to protect the surface. Apply it with a brush the first two times, apply the third layer with a taloche. Start from down of the wall to avoid drops (which dry immediately and are visible afterwards). Be careful with linseed oil, it really darkens the colour! You can apply enduit on nearly every foundation as long as the it is dry, even, has no fissures and a unique surface. Some needs more preparation, e.g. plasterboards needs to be painted with an acrylic paint for bonding of the enduit. Insulation of an old, stonewall house is done with the renewal of the external and internal plaster as described above. These walls are usually 40-70 cm thick, + 3-5 cm external plaster and + 1-3 cm internal plaster. Mixing hemp into the corps d’enduit improves the heat transfer coefficient. In that case, your corp d’enduit will be about 7-8 cm thick. When you are thinking of installing an energy-efficient heating system, then choose a wall heating and/or floor heating. Any kind of applied external artificial thermal insulation will lower the ability of the wall the breath. As a result, the humidity will stay in the wall and either leave to the inner parts of the house if these walls are just plastered with lime mortar, or stay inside the wall in case the inner walls are also improperly covered. To improve the heat transfer coefficient you need to lower the humidity in the walls, which you will make with the re-plastering as described above and with the accompanying restoring measures such as applying a gutter, restoring your old windows, doors, the roof and floors. However, what I described above are the ecological and, from the material point of view, rather inexpensive methods to plaster walls. You only need time and some experience. Contrary, there are a lot of ready to apply products (ecological and non-ecological) for a bigger amount of money (and with some chemicals inside) available in DIY stores.